In this page equation of line solution16 we are going to see solution of each problem with detailed explanation of the worksheet slope of the line. 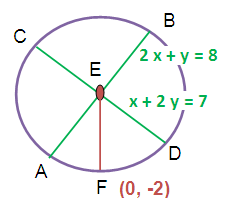 (17) If x + 2 y = 7 and 2 x + y = 8 are the equations of the lines of two diameter of the circle, find the radius of the circle if the point (0,-2) lie on the circle. (18) Find the equation of the straight line segment whose end points are the point of intersection of the straight lines 2 x – 3 y + 4 = 0, x – 2 y + 3 = 0 and the midpoint of the line joining the points (3 ,-2) and (-5 , 8). 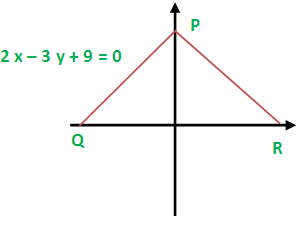 (19) If the isosceles triangle PQR, PQ = PR. The base QR lies on the axis, P lies on the y-axis and 2 x – 3 y + 9 =0 is the equation of PQ. Find the equation of PQ. Find the equation of the straight line along PR.